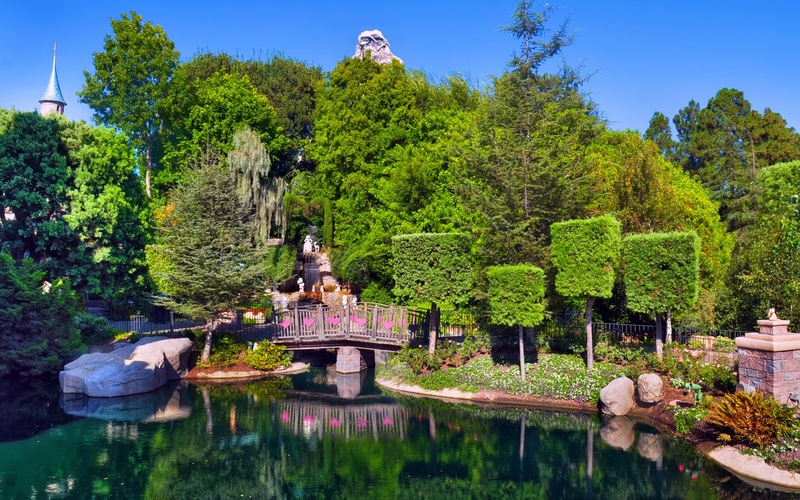 The main way to go from The Hub into Fantasyland is by crossing the drawbridge of Sleeping Beauty's castle, but there are alternate, less traveled routes available for those who want a more peaceful meander. For instances, just east of the drawbridge is a pathway from Tomorrowland that passes by Snow White's Wishing Well and provides a view of some stone sculptures of Snow White and the Seven Dwarves. Interesting factoid about these figures... when they arrived, the Imagineers found that Snow White had actually be cast as the same size as the dwarves! However, through careful positioning and manipulation of forced perspective, the Imagineers were able to position her to appear properly scaled. By setting her in a higher and seemingly farther away position, the Imagineers created the illusion of proper relative size. Just some pixie dust in the arsenal of Disney's designers' tricks! A view from the castle drawbridge toward the bridge next to Snow White's Wishing Well.